Smoke rises in the rebel-held town of Nawa, about 30 kilometres north of Deraa in southern Syria on Wednesday, during airstrikes by Syrian regime forces. 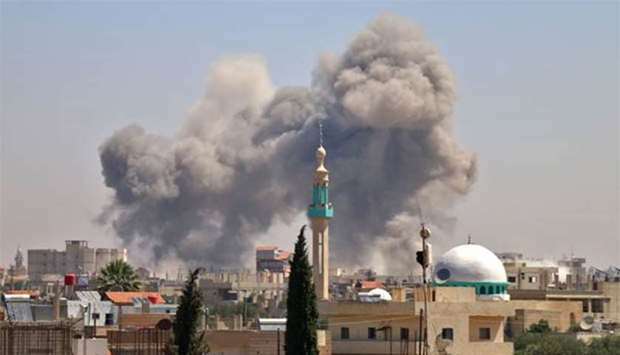 The Syrian Observatory for Human Rights said on Thursday that air strikes have killed 46 people, including children, since yesterday in rebel-held parts of Deraa province. Government warplanes have pounded towns in southwest Syria in recent days as a Syrian army offensive, backed by Russia, gathers pace. An army officer told reporters, on condition of anonymity, that the Syrian Air Force has mobilised some 60 fighter jets for Daraa offensive. Six military airports, including Mezzah, Dumayr, Khelkhaleh and Al-Seen, are also reportedly taking part in the assault. Jens Laerke, spokesman of the UN Office for the Coordination of Humanitarian Affairs (OCHA), yesterday confirmed that civilians including children had been killed and injured and a hospital had been put out of operation by an air strike. The intensified attack has resulted in 45,000 people fleeing their homes for Jordan. But they were met with a closed border yesterday, after Amman previously stressed that the country could not take another wave of refugees, and called on the international community to arrive at an urgent resolution to the conflict. Jordan already hosts an estimated 660,000 Syrian refugees, although authorities put the actual number at over one million. Jordan says it has spent more than $10 billion on hosting them. The Syrian regime’s latest assault on the south is a violation of the de-escalation zone agreed by Russia and the US last year. But although Washington has warned the Assad government against escalating violence, it has done little to dissuade them, instead informing Free Syrian Army (FSA) fighters that they should not expect US military support in their efforts against the offensive. However Bashar al-Assad is aiming to restore control over Syria at the borders with Jordan and the Israeli-occupied Golan Heights, building on his military’s momentum elsewhere in the seven-year conflict. He don’t care that Jordan said it would not open its border to tens of thousands of civilians fleeing the attack. 14-year-old teenager, wounded in the stomach and with shrapnel the whole body, a 19-year-old boy with leg injuries and splinters in it, a 25-year-old man with left leg injuries. The number of childhood marriages is increasing greatly among Syrian refugees. War and poverty make more and more Syrian parents poison their young daughters, reports Al-Jazeera. At the same time, more than 160,000 people have been expelled under the Syrian military’s new offensive in the southwestern part of the country, according to the UN. The long and bloody civil war in Syria leads to increasing childhood among the refugees. Homelessness and poverty as well as caring for the girls’ honor and security in the chaotic conditions are the background to early marriage, reports the Al-Jazeera news channel.